There are various different shopping experiences in Bergerac, according to which part of the town you are in. In the Old Town there are limited shopping facilities. There are a sprinkling of boutique type shops to wander into, and a couple of 'gift' shops, but the emphasis in this part of Bergerac is on cafes and restaurants, of which there is quite a good selection in all price ranges. There is a lovely indoor market which is a good place to pick up nice fresh foods, delicious cheeses etc. The indoor market is open every morning except Sunday. Head further away from the river and the old town and you will find the main shops in Bergerac. You will find most French high-street shops for clothes, telephones, spectacles etc - pretty much a normal shopping centre - and part of the region is pedestrianised. Clothes shops include Mango, Promod, Camaieu, Kookai and a number of nice boutiques. The main street of the New town has had its pedestrian area significantly increased and outdoor cafes make this a very pleasant place to sit in the summer. On the edges of Bergerac there are now two main centres centred around hypermarkets - one based around ELeclerc on the route to Bordeaux and one based around Intermarche at Creysse on the route to Periqueux. Various other shops and facilities are also found at these locations, which are typically good value for money and ideal for large supermarket trips. The e-Leclerc also tends to have some of the cheapest petrol in Bergerac - also useful if you need to refill your car before returning it to the car-hire centres at the airport. 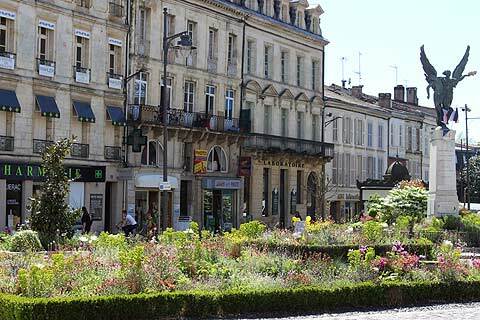 Bergerac market days are Wednesday and Saturday, in the town centre around Place Gambetta. The main street market is a large and lively traditional French market making this is a good time to visit the town. The Saturday market in particular is an extremely good market and well worth a visit. It is one of our favourites in the area.